In a Players’ Tribune essay, Earl Thomas says he “deserves” contract guarantees that protect against injury. He must think he’s playing baseball or basketball. 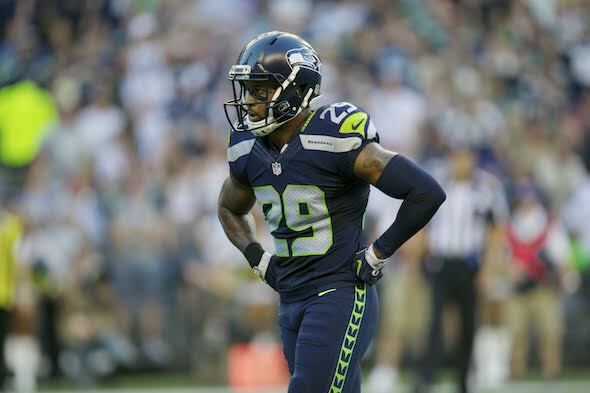 In Earl Thomas’s first-person essay for the Players’ Tribune published Thursday morning — the first public airing of his position — the Seahawks’ recalcitrant star finally exposed the fundamental disconnect driving his holdout. He thinks he’s playing basketball or baseball. At least, he’s thinking he’s playing under the collective bargaining agreements of either MLB or NBA, both of which guarantee many more contracts, and portions of contracts, against injury than does the NFL. Let’s take a look at the key point of his argument, which has nothing to do with his affection for Seattle and his teammates, or his splendid eight-year history of play, or the wrong-headed idea put out by critics that he’s being selfish. Let’s break down Thomas’s statement. Deserve protection against injury? No. Thomas’s degree of misunderstanding is such that I have to believe he composed the essay without running it past his agent, David Mulugheta. And if he did run it past his agent, he needs a new agent. Thomas is right that he’s risking his body to deliver value for the organization. But that’s true with every player under contract with the NFL. Thomas is neither more nor less deserving of financial protection from injury than any of them. He is a member of the NFL players union, an organization that has been far less successful than its counterparts in pro baseball and basketball in negotiating with team owners for more guaranteed money for most of its membership. That’s primarily because the union decades ago accepted a harder salary cap for player payroll than the other sports. That happened despite the fact that, for obvious reasons, football has a far higher incidence of career-ending injuries. A primary consequence of the cap is to retard the use of guaranteed money by owners to maintain maximum roster flexibility in a sport that has far more players to pay than MLB or NBA. Obviously, there is some guaranteed money in the NFL. In the latest Seattle example, the contract of LT Duane Brown was extended Friday for three years despite his age, 33 next month. The maximum potential value of the extension, according to spotrac.com, is $34.5 million; however, only $16.25 million is guaranteed. The former all-pro solves a large weakness in the Seahawks offense, but the guaranteed money is at a risk level the Seahawks think is manageable for a position not dependent on speed. But a similar deal for Thomas is unlikely to please him, because at 29 he believes he’s at the top of his game and deserves something closer to what the market leader, Kansas City FS Eric Berry, received: Six years, $78 million, $40 million guaranteed, with an average annual salary of $13 million. That level of guarantee to a player over 30, no matter how good, who plays a speed-dependent position, is likely the deal-breaker for the Seahawks. It is especially true now that the three-year extension given SS Kam Chancellor blew up with a career-ending neck injury last season. Over 2018 and 2019, the Seahawks owe Chancellor $12 million in salary guaranteed protected from injury, unless a settlement is reached. Ironically, one of Thomas’s greatest virtues — he plays all out, all the time — works against him in negotiations because of an increased chance for injury, even though the club would never admit it. He sort of made the point himself in his essay. It’s understandable that Thomas would want an extension and a larger guarantee after what happened to ex-teammate Richard Sherman. After tearing his Achilles tendon at midseason, Sherman, one of the greatest players in club history, was unceremoniously dumped for nothing before free agency began in March. His career continues in San Francisco, under a small-guarantee contract heavy with incentives. Obviously, Sherman’s negotiating position was compromised by more than injury. He wore his coaches out. They were done fussing with him. Thomas also did himself no favors when he publicly solicited Cowboys coach Jason Garrett in December by saying, “Come get me.” If the coaches and staff were not infuriated by Thomas’s foolishness, I clearly overestimated them. The episode isn’t a deal-breaker, although it could be a tie-breaker for some in the front office if they were debating whether to extend Thomas’s contract. Apparently they aren’t. There’s no evidence from Thomas’s essay or coach Pete Carroll’s remarks at training camp that talks are under way. He has a year left on his deal that will pay him $8.5 million, which is now a little less because he’s being fined $40,000 for each day he misses. The Seahawks are as unlikely to reward a holdout as Thomas is unlikely to understand that he doesn’t “deserve” protection from injury — unless the union wants to make guarantees a far bigger deal in the next collective bargaining negotiation with owners. That likely would create a counter-proposal from owners demanding the players reduce their 50 percent share of NFL revenues. Such a development likely would be after Thomas is retired. For now, the stalemate continues until the Seahawks receive a trade offer they like better than getting Thomas for half a season (by CBA rules, he must play half a season to gain free agency in 2019). Perhaps the Seahawks should consider including the Yankees and Lakers in trade talks. Sigh. So tired of people who won’t honor the agreement they signed their name to. Can’t argue with your fatigue, but the maneuver worked for Duane Brown and the Seahawks are the beneficiaries. I hear you. My fatigue comes from real life bleed-over, too. People who just won’t honor agreements that they sign their name to. Your point is a good one, Effzee. Putting your signature on a document is supposed to mean something. I guess I am a dinosaur in thinking a person should fulfill the commitments they made. Keep in mind that probably more than 90 percent of NFL contracts are honored by both sides without incident. First off, I love Earl. I want him on the field for the first game – and for every game – this season. That said, the only argument / explanation from him that I think I would “buy” is the one he only barely implies …. If the team had basically “promised” him that they would “keep the band together” if he left money on the table (which he may or may not have done) and then didn’t do that – regardless of circumstance – then ….. MAYBE he’d get the benefit of the doubt from me here. But even then it would only be up to whatever amount it is that he “left on the table,” not whatever his newest demands are. At the end of the day, you signed a deal and you need to honor it. Unless the other party (the team) broke the agreement first. The argument that people should honor the agreement they signed is a moot one in the NFL , as teams ( employer ) regularly break their contract with a player ( employee ) every time they release said player before their contract expires . They do so with absolutely no ramifications other than guaranteed money , the real issue with the players .. It astounds me – the posts I read on PFT and elsewhere – that people don’t understand the real crust of the biscuit here ; the Seahawks are guaranteed a 3rd round compensatory pick next year if they don’t franchise tag him and he walks , so why would you trade him for anything less than a 2nd rounder ? To my knowledge , no such offer has been made by Dallas or any other team , and John Schneider is no one’s idiot . The Seahawks will have a lot of cap room in 19. They get the proposed compensatory pick for Earl leaving only if they lose more FAs than they sign. Because injuries/retirements aren’t knowable, it’s hard in August 18 to count on the conditional pick being there. Art hits all the pertinent points. This is the NFL and, in an even larger context, capitalism. Earl’s demands are beyond his Seahawk-specific value. “It’s that simple.” Would still love to see them work something out though. I’m probably dreaming, but is there any chance they could find an incentive-type deal that extends Earl without too much on the hook for the Hawks? Conversely, I also wonder what the chance is that Earl, in an act of epic stubbornness, sits out the entire season? No and no. Earl wants guarantees, not incentives, and as I mentioned, he can’t sit out more than eight games without disqualifying himself for 2019 free agency, per CBA rules. Ah… missed the “disqualifying” part. But here’s a way out: Earl hires Sherm as his new agent, and Sherm gets him a deal like his own…all incentives, low-risk for Hawks! Sherm’s deal is exactly what Earl and all healthy players try to avoid. Beyond the advantage to management, incentives can often hinder a player from taking the necessary physical risks. It’s a real trap: He has to make plays to keep his job and make money, but each play has a chance to be a season-ender that comes without the compensation of straight salary. The irony of the situation is almost amusing. Earl wants guarantees because he’s seen what happened with Chancellor and Sherman. The Seahawks will not offer guarantees because they’ve seen what happened with Chancellor and Sherman. Sadly, Earl – like Kam – does not appear to understand his leverage (or lack thereof). And I agree, he cannot possibly be getting his advice from his agent. This holdout is more harmful to Earl than to the Seahawks in both short and long term. If he’s looking at Duane Brown as template, then he’s also not understanding the difference in the current market within his own league between safeties and offensive linemen. The union has never succeeded in pressing owners for a higher floor of guaranteed money, helping creating the flashpoint regarding Chancellor/Sherman, as well as many before them. And with each successive CBA, holdouts have less leverage. The main reason Brown’s holdout worked as well as it did was because of the degree of desperation by the Seahawks. Excellent article! I’m thinking that guarantees for every player’s contract may be the final solution to the next contract dispute, which will be a humdinger. But not ‘total dollar’ guaranteed contracts based on the original agreement of ‘play and pay’. It’s possible the NFL may agree to set amounts paid to players injured and cut or cut for any reason during the tenure of a signed contract. $250,000 per year through to the end of the contract term? $500,000 per year? But I don’t see they can afford to agree to guarantee all contracted dollars regardless of whether the player plays or not. That would be crazy given the ‘Chancellor’ situations and so many players on one payroll, as well as incident rates of injury. It’s a strange world to feel bad for guys making tens of millions of dollars, but the owners really have the players over a barrel with this CBA. I can see their frustration when guys over the NBA, a league with less revenue, making $45 million a year. Hell, hockey players have it better. Granted, rosters are MUCH smaller, but so are the revenues. An NBA’er might deal with joint pain for the rest of their days, but their heads are intact. I don’t see this changing. The only thing that would change this is a protracted strike, but for the rank and file, a long strike is half their career. Also, in this strange land we live in, the average fan will probably take the owners’ side against a bunch of ‘greedy athletes’ because of those poor, poor, billionaire owners just squeaking by. I love the NFL, but this just isn’t sustainable. Enjoy it while I can, while I have my head in the mud over all the risks my heroes are taking for my entertainment. Good observations. Numerous players, including Sherman, are upset with the union’s missteps that created the situation you described. Most fans do side with owners because there’s no salary cap for them that forces public disclosures of their earnings. Yes, they’re billionaires, but that phrase is opaque and generic; not as impactful as seeing a young wide receiver make $5M for feats the fan thinks he could almost do. Hockey players also have longer careers and uaranteed contracts. Most interestingly, it also has “buy-out” clauses: If a player is a bust, a team can pay him half the value of his current contract to release him and get his contract off the books and salary cap. I wonder if such a “buy-out” clause would be acceptable in the next NFL-union CBA talks. Thanks for the NHL comparison. Didn’t know that. It could increase the number of opportunities for players by reducing the financial risk to owners. Love me some Earl all day long – when I loaded up on PC generation jerseys, his would easily have been the first, before Russell’s or Marshawn’s, if the broadcast coverage didn’t focus so much more on the offense than defense. In person, flip a coin between him and Sherman on who was most fun to watch. As I’ve maintained, he’s worth 1 1/2 to 2 players on the field. After watching the HOF game last night, I trust that he could even contort himself mid-air like a cat to avoid hitting with the crown of his helmet. He’s no doubt an all-timer and also that he’s been totally committed to the team and fans he’s been playing for. The Seahawks have shown that they’ll pay a player and renegotiate with one year left on their contracts, and not before. I trust that they have a fair offer on the table, but who knows if it’s influenced by the burns of Cam’s and others late going contract renewals and not quite so meaty. I’m thinking the KC contract for Berry is a phenomenon and unrealistic based on the market for safeties, so the Seahawks’ offer more than likely would not make Earl the highest paid safety. Earl needs to be realistic, and it’s disturbing that he’s not. It took immense manhood for Cam to come back after his embarrassing holdout, and the same needs to go for Earl now that he’s dug a bigger hole with his Player’s Tribune article. When players go off the deep end like this, one wonders who is spewing influences into their ears. Then again, Earl has always made strange if not bold statements off the cuff, all my himself. I wish the best for Earl, and we’d love to have him be a Seahawk for the remainder of his career. He just needs to come down to Earth long enough to make some sense, get his contract squared away, and leave the flying around for the gridiron. I’ve not heard that the Seahawks have offered any extension proposal, only the insistence that Earl honor his final year at $8.5M. I think regarding third contracts, they have become risk-averse, especially for speed players. Even though the Seahawks are tight lipped about business dealings in the works, they haven’t made him an offer – based on Earl’s PT article: “Offer me an extension. Or trade me…”. No offer – just honor your existing contract. It’s a bit weird that he’s being handled differently than Cam and Marshawn, which I thought were their third contracts. Seems inconsistent, but maybe they’ve changed their ways, which have shown to have burned them. All logical, Art, though a point unsaid is whether Earl could fit as well now with the new guys around him. Part of his speed is anticipation, and who knows if that would be the same without he, Kam and Richard trading info between plays. We would all like to see players that have excelled and put it on the line for years get rewarded, but the CBA with its cap has practical considerations no team can ignore. If the terms could be modified for guaranteed money to extended players, such as half the guarantee would not count against the cap in the case of career-ending injury, they would be more likely to get that gold egg as they pass into the twilight of 30 something. As for Brown getting his deal, how many pro bowl LT’s do you see wandering the streets looking for a job . . .
Earl fitting in is a tiny aspect of the equation. No matter who his teammates are, he will make them all better. Higher guaranteed minimum money for extended players is a start toward fairness, but the NFL owners have so far resisted the exemptions that have turned the NBA’s cap to mush. Couldn’t he buy an insurance policy on his future salary earnings to cover him if he gets hurt? I mean, even if the premium came out of his own pocket he’d be protecting his downside which would allow him to play this season and then get a free agent deal next. If he suffers a Kam-like career ending injury the insurance policy would pay out some portion of his remaining expected earnings. What am I missing? An insurance policy probably can be written to cover anything, but the premium likely would be too outrageous even for Thomas. And I think the union would be mightily upset with players taking all the risk on their own dimes and letting teams off the hook. Two must reads every week…George Will and Art Thiel. A sentence in human history never before written. Thanks. Yeah, Art, that one stopped me. Not that George isn’t a fine, tweedy fellow . . . It seems the Hawks find Duane Brown more valuable than Earl Thomas which is a team prerogative. Personally, I think NFL players deserve more money and some financial security after their careers are over and their health issues related to football begin to diminish the quality of life for them and their families. Earl has earned all his money in the past and an extension ( 1 or 2 yrs ) or trade is what the Hawks should do. Wait him out and the conflict on this team continues. The LT spot is harder to fill well. Each CBA has improved benefits for players, especially lifetime medical coverage. But the guaranteed salaries are harder to come by, although there is no cap. A few QBs are getting close to all-guaranteed deals. The Hawks can fill Earl’s spot with Bradley McDougald. Not much behind Brown. Earl’s column in The Players Tribune IMO came across as him using them as a means to further his position and undermine the Seahawks. Disappointing that the Tribune would allow that but expect no less. As discouraging as it is that Earl wants out of Seattle and go to his favorite team (he’s pretty much prepared us for that since last season’s Cowboys game and subsequent social media posts) the way he’s going about it is wrong. I imagine Brown getting an extension despite being new to the team didn’t go over well with Earl but there’s a huge need for O-Line players on the team and the team is fine going with Bradley McDougald. Earl should look up who Todd Bell and Al Harris are and see how their holdouts in Chicago worked out. The Seahawks are in the drivers seat on this. If what happened to Sherman motivates Earl I don’t think that’s the best example. Sherman said after his injury he knew it was going to happen at some point during the season and if that’s the case he shouldn’t have been playing. If anything he should look at how Kam’s holdout worked for him. The team didn’t talk to him until he returned. Right now the Seahawks need to assess where Earl’s attitude and approach are at before doing anything and it isn’t in a good place right now. Earl is playing a PR game by attempting to rally some public support for his position, but it isn’t going to work. The PT is a nice platform to hear players unfiltered, but it can be propaganda. Earl has put himself in a corner because if the Seahawks either trade him or extend him, they’ve lost. Bad precedent. They won’t do it.